Choosi Chudangane song Lyrics from Chalo Telugu movie. Lyrics of Choosi Chudangane is drafted by Bhaskar Bhatla. Choosi Chudangane song is sung by Anurag Kulkarni, Sagar. The film features Naga Shaurya, Rashmika in lead roles. Lyrics to Choosi Chudangane song,Choosi Chudangane song translation in english. 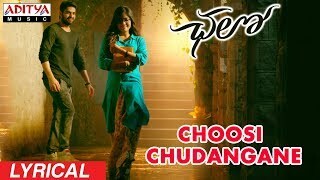 Choosi chudangane song lyrics from Chalo 2018, starring Naga Shaurya, Rashmika Mandanna. Choosi chudangane sung by Anurag Kulkarni, Sagar, Bhaskar Bhatla Choosi chudangane lyrics. supebbb song, music is fentastic.